Can a Smartphone App Help the Homeless? In 2005 Stanford University got a huge grant to create a Design School. Unlike the name suggests, it was not a beautiful new building for Stanford artists. The audience was much broader and the intention more universal; the D-School focused on teaching students to solve problems. Almost 10 years later, the term design thinking is spoken in primary and secondary school hallways from Georgia to Arizona. Inspired by design firms like IDEO, the D-School founders envisioned helping students learn to solve real world problems the way many designers do. First, understand people deeply—their needs and experience around a given issue. Talk to them, watch them, take notes. Then, working collaboratively with people who are not like you, imagine solutions. Build a prototype. Test it. Refine and present. Over the years the D-School has formalized the protocols it uses to walk students through the design thinking process and shared those widely. The AHM, or Automated Help Machine, asks the user a host of filtering questions and pops out information specific to the user’s needs. Sometimes, TNS students said, the problem is not knowing where to go for help. The HomelessHelp App provides updated information on your phone about nearby shelters and services. After learning that most of the homeless people had smart phones, the students created an app to meet the needs of the person who is homeless as well as the person who may want to help but doesn’t know how. The Counseling Corps envisions a group of graduate students with degrees in counseling or social work who travel to areas where homeless people gather to help the many with unmet mental health needs. None of these ideas could have existed without the trip to the Atlanta Mission. Hearing from Michael Sheppard, shelter director, and a host of currently and formerly homeless men, students began to understand the issues in completely new ways. Their imaginations were sparked. Students will continue to research and refine their ideas before presenting them to an audience of community leaders later this month. Learning to understand a problem deeply—any problem—to empathize and imagine solutions is becoming a habit of mind for New School students. 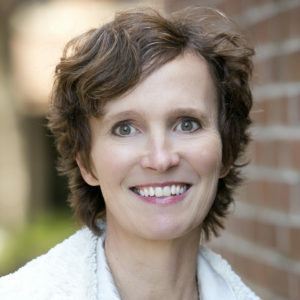 Mary Campbell is a Founder of The New School, and currently serves as the Director of Admissions and Operations. Mary Campbell has a B.A. from UNC Chapel Hill where she was a Morehead Scholar and an M.A. in English from Hollins College.